I went last year to Sepang to watch the MotoGP, to watch Valentino Rossi live. To watch all the talented and brave young men ( and a couple of young women) risk their lives in an adrenalin fuelled sport. I got my tickets, hotel is booked and I am excited to experience the magic all over again. 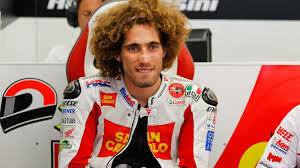 We forget though that it is a dangerous sport and today while watching the Australian leg of the MotoGP, there was a crash where a couple of riders were run over which made me remember that five years ago today in Sepang, one such incident took the life of one talented rider, Marco Simoncelli. The two riders of todays incident were very lucky to walk away with nothing but some bruises and a broken finger. So while I look forward to Sepang to watch these brave young people race round the track, I pray hard that they all stay safe on the track. There was a fatality this year as well earlier in the season, Luis Salom was killed in Barcelona during the practice.